Accras are Caribbean fritters.They're often made with salt fish — fresh fish that has been cured in salt and dried until every ounce of moisture has been drawn from it. But accras can also be made with shrimp in some regions, or with some type of peas or beans. Think of an accra as a Caribbean ​fish cake. Most Caribbean countries have some type of accra in their cuisines, although the exact name can vary from one place to another. For example, Barbados is well known for its fish cakes, which are a type of accra. Trinidad and Tobago also makes a similar version known as salt fish accra. When accras are made with shrimp, they're called shrimp accra, and when they're made pigeon peas, they're called pigeon peas accra. Jamaica's version is called "stamp and go," and "accras de morue" is the version using salt cod that's known in St. Martin. Martinique calls its accras de morue "marinades." 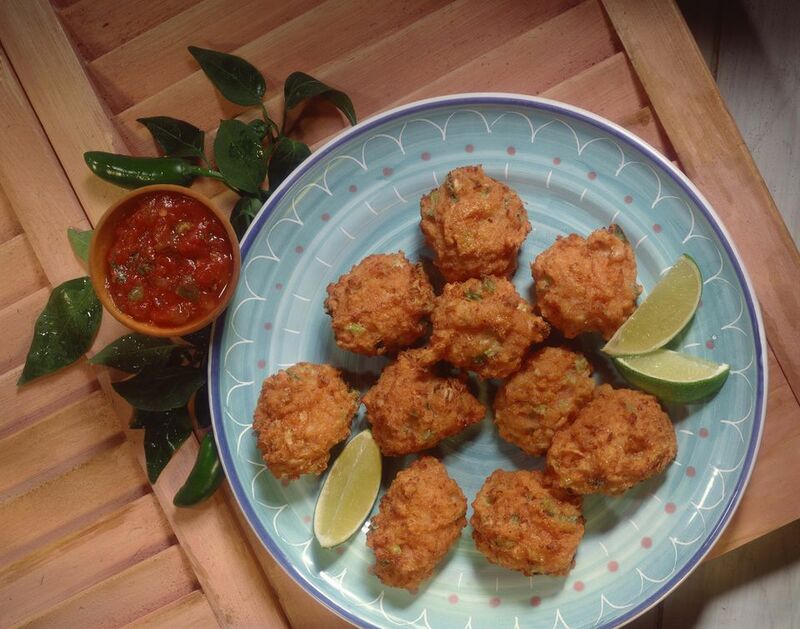 These fritters are almost always made of a batter that consists of the main ingredient in the recipe, whether it be salt fish, shrimp or something else. Fresh herbs and hot pepper are typically added, but this is where most similarities between accra variations end. Each country defines its accra by the amount of flour used in the batter if any at all, or by the addition of baking powder. Accras are sometimes called akaras, a name derived from Africa where it means "vegetable fritters." The original accra concept was most likely introduced by African slaves arriving in the Caribbean region. Accras that use salt fish restore the fish by first soaking it in cold water for at least eight hours or overnight. The water should be changed several times. You might also boil the water, then simmer the fish in it for 20 minutes or so if time is of the essence. This method sometimes kicks off a somewhat unpleasant odor, however, so do it well before your guests arrive. You can also use fresh fish in a pinch, but you'll have to add ample salt to the batter to compensate. The fish is then pureed and other ingredients are added in, such as flour, milk, baking powder, egg, and spices. The mixture is blended well, sometimes with green onions or chilies. It's then deep fried in teaspoon-sized bundles. The finished accras should be bite-sized. The deep-frying part can be a bit tricky. It's important to moderate the temperature of the oil because if it gets too hot, the outside of the fritters will appear done, but the insides will still be raw and unpalatable. Accras are great as snacks and are often served as appetizers at parties and get-togethers. Some people serve theirs with pepper sauce or a chutney. A common sauce in St. Martin is "chien," made with onions, scallions, sweet bell peppers, chili, and spices. Accras can also be served as side dishes with meals.